Qualifications: MB.BS. (Hons), FRANZCP, MD. Clinical & Research Psychiatrist, Black Dog Institute, Sydney. 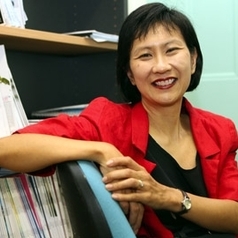 Colleen Loo is a psychiatrist and clinical academic researcher of the University of New South Wales, based at St George Hospital and the Black Dog Institute. She is an active clinician and researcher, with a particular interest in improving treatments for severe depression : electroconvulsive therapy (ECT) and novel treatments for mood disorders, including Transcranial Magnetic Stimulation (TMS), transcranial Direct Current Stimulation (tDCS) and ketamine. She established the first randomised controlled trials of TMS, tDCS and ketamine in psychiatry in Australia. Her team of researchers is also studying the use of brain stimulation to enhance cognitive functioning (in mood disorders and healthy ageing), and neuroplasticity in mood disorders.